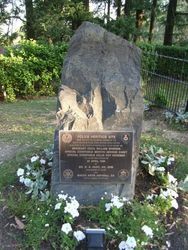 The monument commemorates three South Australia Police officers who lost their lives in a bushfire in January 1951. ADELAIDE, Fri.—A police sergeant instructor and two police constables were burnt to death while fighting a bush fire near Upper Sturt, in the Adelaide Hills, this morning. They were Sgt. Instructor Cecil William Spark (43), married, of Kurralta Park; Special Constable Mervyn George Casey (22), unmarried, of Prospect, and Special Constable Colin Roy Kroemer (33), married, of Glenelg. The victims were members of a police party of 20 sent from the Adelaide police barracks equipped with knapsack sprays in response to a call for assistance. They were among others fighting a blaze in a gully when the wind swept the fire around them, cutting off their escape. 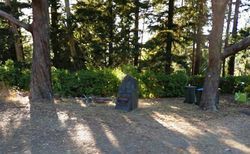 After they had been reported missing, H. Eaton, of the Stirling emergency fire fighting unit, went into the fireswept gully and found the three bodies severely burned. Two of them still had knapsack sprays strapped to them. Two civilian fire fighters overcome by smoke were sent to hospital for treatment. The fire threatened many homes, but was confined to scrub and grassland. Mercury (Hobart), 20 January 1951.